Into the nest flies a hammerkop; out of the nest slithers a snake! Is it a shape-changer? That is once what some people believed about this bird with the hammer-shaped head. 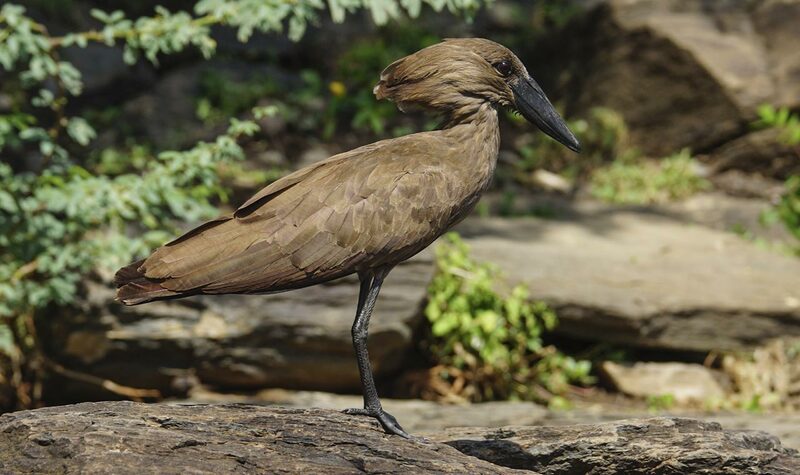 In fact, the hammerkop builds such a big, complex nest that snakes and many other creatures—including bees, mongooses, and lizards—may all call it home. 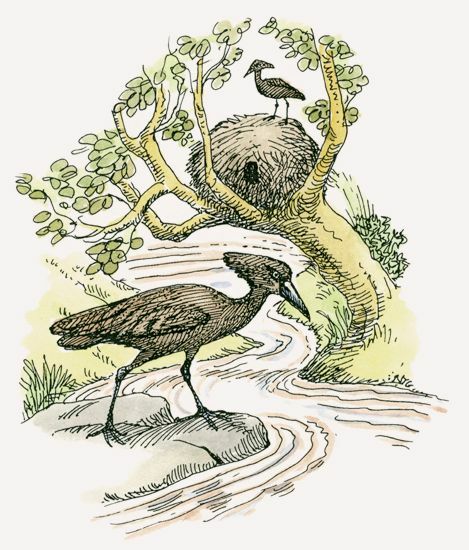 What is most remarkable about hammerkop nests? The amazing number of hammerkops that share one nest. The interior stays dry even during violent rainstorms thanks to their waterproof sides. Hammerkop nests are so large that other animals including snakes, mongooses, lizards, and other birds often live in them at the same time. Hammerkops live in pairs but also gather in groups. As many as ten hammerkops may join in a ceremony where they run around in circles and call loudly. Males raise their crests and flutter their wings. They may also mimic mating. Real mating occurs near the nest. Hammerkops trill and yip, sometimes in chorus. In flight, they may produce a long-distance kyip. Hammerkops are wading birds with partially webbed feet. They usually feed alone or in pairs during the morning in shallow water sources and roost in trees at midday. The overall population trend is stable or increasing. The International Union for Conservation of Nature (IUCN) ranks them as lower risk. Hammerkops eat frogs, fish, invertebrates, and crustaceans found in shallow water. A pair builds several nests during the year, usually in the fork of a tree near water. Each takes about six weeks to construct, and some are never used. Three to seven eggs are laid and incubated for about a month by both parents. The young may begin flying in about seven weeks, returning to the nest at night. Sometimes squatters, such as kestrels, owls, Verreaux’s eagles, or Egyptian geese, take over abandoned hammerkop nests. Sometimes they even take up residence while hammerkops still call the nest home. Hammerkops are found throughout Kenya, including around villages. Hammerkops inhabit southern and central Africa, Madagascar lowlands, and the southern Arabian Peninsula. They live around shallow, freshwater lakes, ponds, and marshes. Irrigated lands, such as rice paddies, also attract hammerkops. Hammerkops build domed nests that are among the largest in the world, soaring up to 6 feet (1.8 m) high and weighing 55 to 110 pounds (24 to 49 kg). Within the nest of sticks, reeds, grass, and dead plant stems is a mud-walled chamber where the eggs are laid. The parents decorate the nest with brightly colored objects that they find. You can see one such nest on the Mpala Live! river cam.